The Rocking Pony: GIVEAWAY! FREE! There is so very, very much to talk about here, but first a giveaway! This was from Louie's blog, but I'll copy and paste here for convenience. Enter! Win! a sample box of pet food and treats they'd sent our way to test. We've exhausted the contents of that box, and feel we can give an honest review of their products. Mom note: You need to expand on this a little more, Louie. Okay, fine. They're VERY delicious. Honestly. Whose blog is this, anyway? What else does a fellow pup need to know other than how good something tastes? I can't speak for the cats, but... hey! Who let the cats in? This is a dog blog! Merlin The Kitten: I can speak for the cats! Shove over, Louie. Fenway The Kitten: You're not the only cat on the acreage, sir fluff. Give me room to speak, too. Percy The Cat: You kittens can have the spotlight. I just want to eat the food. Merlin The Kitten: The food is gone, Percy. You ate it ALL. Percy The Cat: Louie is right, though, It's delicious. I liked the small bites. Some of the food that mom tries to give us is so large that you look like the teen boys when they shove a whole donut in her mouth. Fenway The Kitten: I thought you weren't going to hog the spotlight, Percy. I want to go on record as saying that the tiny food is perfect for us tiny guys. Imagine having to cut your food into bites just to eat it, and not having a knife. Or hands. Tiny bites are good things. Merlin The Kitten: Talking about good things, those treats were my favorites! The bites were a bit larger, but when it's a treat, that's a very good thing! Percy The Cat: You kittens are forgetting some very important things, such as the fact that the food is slow baked, in small batches. I'm pretty sure this means that quality goes into each batch. TruFood also has 70% more raw protein than typical dry cat food, and cats need good protein sources for optimal health. In addition to all that protein, our food has grain-free fiber, antioxidants and probiotics. While those are big words for small felines, they're important ones for health. Fenway The Kitten: Well said, Percy. Since I can't add anything more, other than how delicious it is, I'm going to show everyone what a bag looks like so that they can find it in stores. Sheesh, cats, huh? A dog starts a blog and the cats think they can just take it right over. 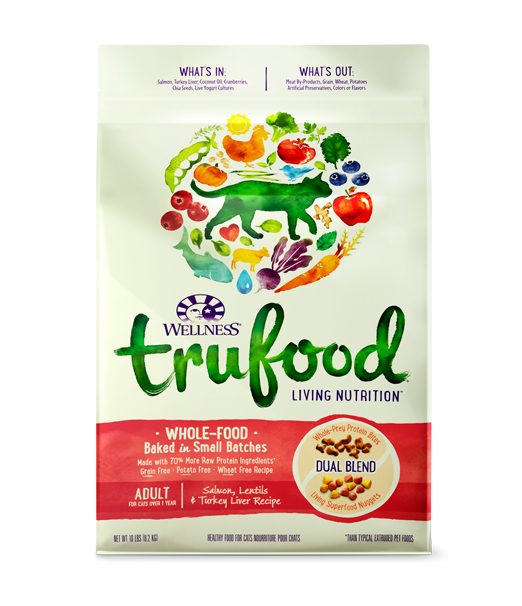 The nice thing about cats is that they can be lured outside again with some Wellness TruFoods treats tossed out the door. So now that they're gone, I can talk about how good the dog food is, since mom insists. Like the cats said, the dog food is also baked in small batches and has 70% more raw protein than typical dry food. It also has the big and important words like antioxidant superfoods and probiotics. The fresh, whole foods used can help support a dog's immune and digestive systems as well as our joints, skin and coat. Mom took the bag of food along when we had a getaway with the family the other weekend. The small bag was easy to travel with, and since I don't eat much when we're away, what I didn't eat simply went back into the bag. Mom loved that the bag closes with ginormous velcro, so she didn't have to worry about spilling any of the yuminess inside. My favorite food, however, was the wet food. They come in 5 oz cups and are so delicious that I lick every morsel up before I walk away. (I never do that. Ever.) 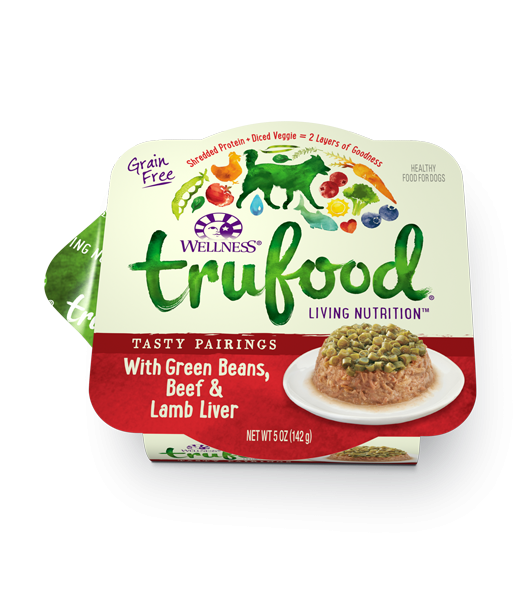 The wet dog food has beef, chicken, lamb livers and low-cal green beans in chicken broth gravy. It makes your mouth water just reading it, doesn't it? I've become quite the treat snob, which makes mom's head explode. Even if something is all natural and nothing but goodness, I'll sometimes turn my snooty little nose up at it. Mama says this is unkind manners and that a pup should be grateful for any treat he gets. I can't help it that I have such a refined palate, can I? But the Wellness TruFoods treats pass my test of yumminess. 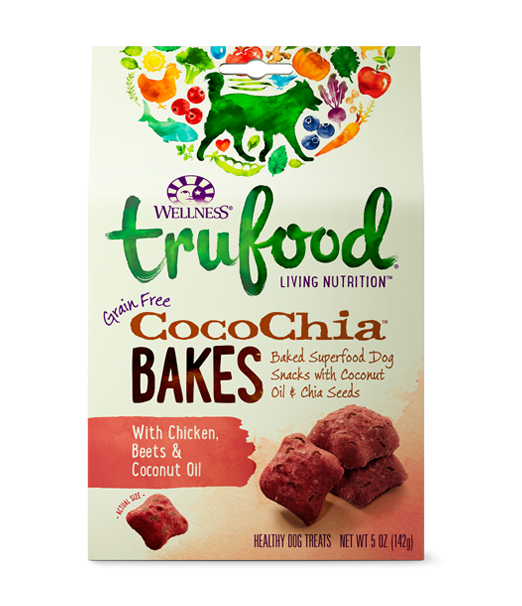 We are loving the TruFood CocoChia Bakes, with coconut oil and chia seeds. They support healthy skin, coat and joints, so they're not just a snack food, either. Win! Mama says I can still only have one or two a day, because snacks are to be savored. 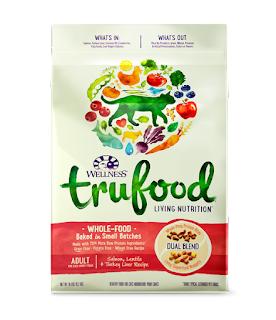 Mama says the very kind folks at Wellness TruFoods are giving away another box of pet foods to try, too, and I get to share them with you! Just leave a comment here to be entered, and we've added some optional ways to get your name into the drawing a few more times! Good luck! Your dog (and cat) will just LOVE this stuff. It really is delicious.